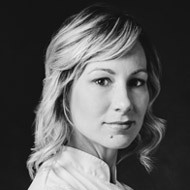 Lauren V. Haas is today an instructional chef at Johnson & Wales University, College of Culinary Arts (New England) where she teaches subjects such as Chocolates and Confections, Advanced Petits Gâteaux, and Farm to Table Desserts. Haas balances her teaching work with collaborating as ambassador in the USA of important suppliers of the sector. A highlight in her career is her work alongside Patrick Musel, Anil Rohira or Bill Yosses. Throughout this fascinating professional journey, Chef Haas has continued to cultivate sensitivity, a taste for nature, and a passion for the craft.